Little girls love to use their imagination in pretend play games. I remember when I was small, my friends and I often play what we call in Filipino "bahay-bahayan." It's a pretend play game where I or one of my playmates pretend to be the father, mother or daughter. We could go on with this game for an hour or two. One of the favorite roles of girls to pretend play is that of a doctor. One girl can play the role of a doctor while her playmates or her dolls or stuffed animals are the sick patients. This toy is on children’s wish list according to Walmart’s Hottest 25 Toys list for 2016. It’s a toy that’s both educational and a kid favorite. The cart is a fun, on-the-go toy that’s designed with a lot of eye-catching colors. Your little girl can push this hospital care car and flower wheels will roll smoothly over surfaces. She can make her rounds from room to room to visit her toy patients. The cart is packed with items that kids can use to take care of injured or sick toys. She can emulate Doc from the show airing on Disney Junior. Her toys can be lined up as patients waiting to be seen. During the exam or treatment time, kids can put the toys in the middle of the cart - much like a patient table at the doctor’s office - to find out what’s wrong with the patient. Whether the toy is sick or just in for a checkup, the cart contains just what your child doctor will need to help out. She can use the otoscope and thermometer to check her patients. The X-ray comes with cards that show the Doc McStuffin characters on the Disney Junior show. When checking out the patient’s heart with the EKG, the cart can enable her to see the patient’s heart patterns. The heart rhythm tool is on a roller at the front of the cart for easy access. There’s also a blood pressure pump that she can use to check out how the patient is doing. A familiar tune that she hears on the show can play and there are various buttons and things that can make sounds like in a real doctor’s office. The cart keeps all of the medical tools neatly in the drawer so your daughter can rush off to treat the next patient. The hospital care cart includes one toy - Findo, the little dog - so your child can get started right away treating him. The Doc Mcstuffins Hospital Care cart does not only encourages kids to use their imaginations, but teaches them to be kind and caring, too. The suggested age range for this toy is 3 years old and older. 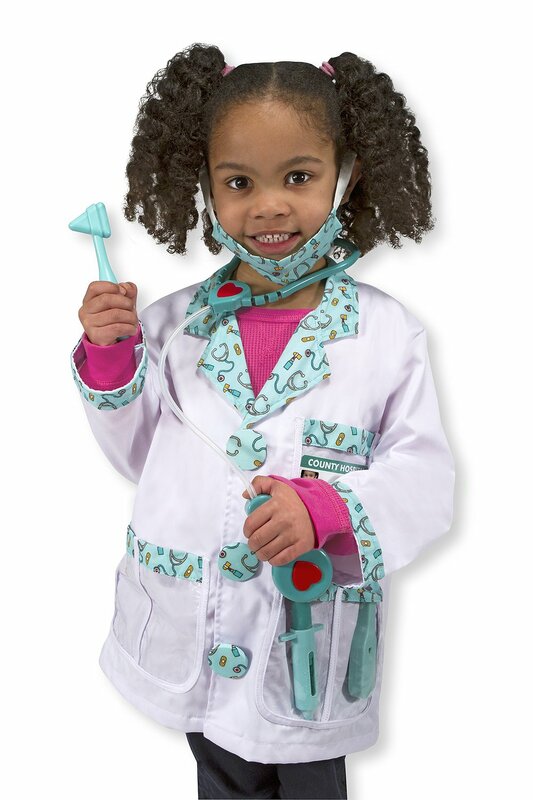 Your little girl will like dressing up and playing with the medical accessories included in this doctor pretend play set. It has a washable doctor's coat and a surgical face mask. In two see-through pockets in front of the coat, she can put the thermometer, ear scope, reflex hammer and syringe. Of course, there's also a stethoscope that makes sound effects. These are the tools she can use to check her patients. This fantastic doctor pretend play set can help your little girl use her imagination and dream of what she would like to be some day. The realistic and functional accessories in this kit can build her self-esteem and explore the career she hopes for. This doctor play set is recommended for ages 36 months to 6 years. Help your little girl learn about the human body and engage in doctor-patient role play. This will also prep and calm your little girl when she visits the real doctor. It's also a good way to teach kids how to have good health habits. 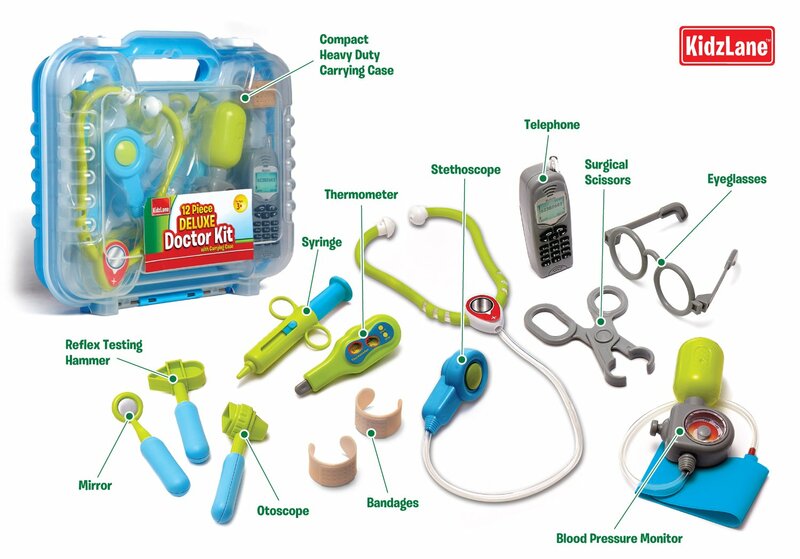 This doctor kit set from Kidzlane contains 12 pieces of medical tools and gadgets. Playtime comes to life when using gadgets like the cell phone and stethoscope that produce realistic sound effects. She will hear real-lfe heartbeat and coughing sound when checking her patient with the stethoscope. Included in the kit are the stethoscope, eyeglasses, thermometer, otoscope, blood pressure monitor, reflex testing hammer, syringe, bandage, mirror and surgical scissors. All of these are packed in a sturdy carrying case. So, it would be easy to pack these doctor tools and keep them in a safe place. 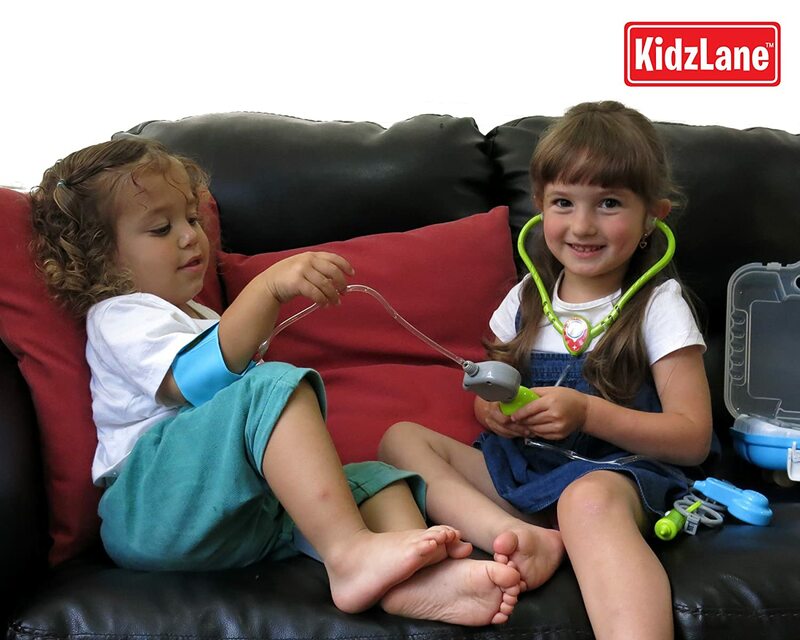 This Kidzlane Doctor pretend play set is recommended for ages 3 years old and up. With this complete set of role play set, your daughter who dreams of becoming a doctor some day will have lots of fun playing and learning. 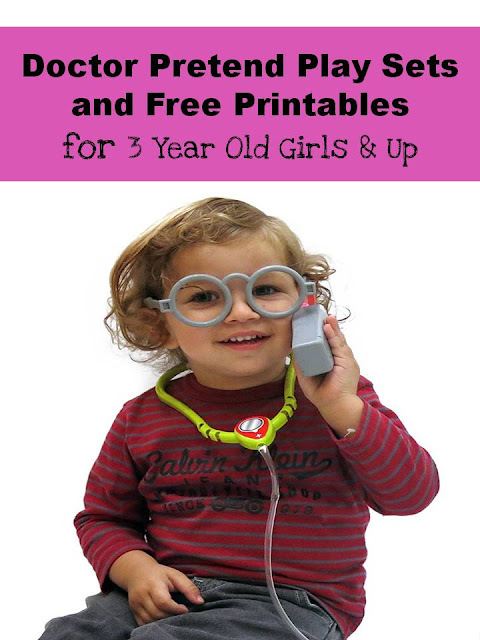 Extend the moments of fun imaginative play by letting your daughter use Doctor Pretend Play printables. You can print out doctor IDs, a patient form, a symptoms chart, an eye chart, physical exam form and a page of prescriptions. Check out these free printables from Free Homeschool Deals and Kids Activities Blog. See more free printables at Pinterest. Awwww, these are cute. Kids into role-playing phase would really love these!